Creative floors manufactured with the finest natural materials, Crucial Trading is the market innovator in distinctive textured and weaved carpets along with bespoke rugs. At our Heaton Moor showroom we offer all the Crucial Trading ranges along with a professional design service from our friendly staff to make choosing your floor as simple as possible. Wool is the most popular of flooring materials due to it being completely natural, versatile and extremely comfortable underfoot. Crucial Trading source the majority of their wool from the mountainous regions of New Zealand where the most luxurious forms of wool originate from due to their high levels of durability, fine texture and purity. Designed to not only look great but last for years to come, Sisal is a hard wearing, fashionable and chic flooring option that will finish any interior with style. 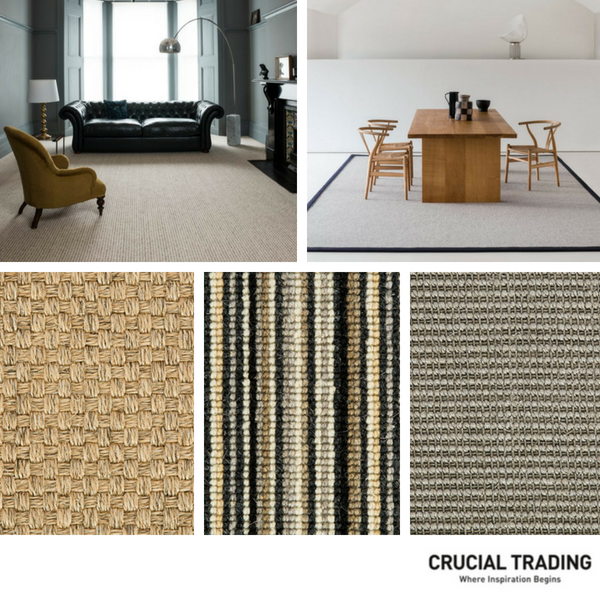 The Crucial Trading Sisal range has many elegant patterns from the eye-catching Bali Stripe design to the traditional Harmony Boucle pattern which can both be made into bespoke rugs with super stylish borders. Arguably the most sturdiest of natural materials on offer from Crucial, the Seagrass will hold up to almost everything. Sourced from Chinese and Vietnamese plantations, this hardy grass stands up to intense heat, ocean salt and monsoon weather before being weaved into signature Herringbone, Original and Basketweave designs that are ever present in the modern home. Extracted from the husks of coconuts and transformed into beautiful flooring, Coir is rich and resilient making it perfect for high traffic areas in the home. Available in chic Herringbone, Boucle and Natural designs, Coir can be purchased as a beautiful lounge carpet or a fashionable bespoke rug. If you're looking for a carpet that's notably softer underfoot, then Jute might be the best option for you. Jute carpet is available in traditional Herringbone and Tweed designs that have incredibly fine fibres which make it super soft and perfect for use as a bedroom carpet or in a snug area.